Will you journey with me back to a critical moment in the history of God’s people? It was the opening decades of the seventeenth century. Less than a hundred years earlier, the Protestant Reformation had begun to sweep through Europe. The rediscovery of salvation by grace alone through faith alone had revived a moribund church and launched an era of bold gospel preaching and gospel-driven missions—millions had responded in faith. Yet only a hundred years later, the fundamental truth of salvation by grace alone through faith alone in Christ alone was under attack. A revival of false teaching was underway. Some were denying the power of God’s grace and putting our final salvation back in our hands. At that critical period, the recently recovered gospel was almost lost once again. Today, you and I face a threat not unlike the one the church faced some four hundred years ago. Around the world, a compromised gospel is being preached, one that says God’s grace isn’t enough to save us. In too many churches, people are being told, in essence, that God has done His part to save us and now we must do the rest. Will you stand firm for the gospel as our faithful brothers and sisters in the faith did? There is so much at stake here, and that’s why your support of Ligonier is needed now more than ever. Since Dr. R.C. Sproul founded this ministry, our mission has been to help people around the world understand that salvation is by grace alone through faith alone in Christ alone. And the teaching you enable is bearing gospel fruit as people are being awakened to the fullness of God’s grace and are growing in His truth. Your support is carrying on the work of those believers who stood firm for the gospel in the early 1600s. The church in the Netherlands responded to the threat of their day by calling a council, a synod of church leaders to respond to those who questioned the Bible’s teaching on sin, the work of Christ, and the power and sovereignty of God’s grace. The teaching of this council has come to be known as the doctrines of grace or the five points of Calvinism. In a day when even those who have confessed Christ for years are confused on the basics of the gospel message, clear teaching is vital. I know of no other ministry that does the same kind of work with the same kind of reach into countries, churches, and homes worldwide that Ligonier does. Of course, we know that this is by the grace of God and is fueled by visionary donors. As the Lord opens doors, we expect by your gifts to reach over twelve million people this year. Through donor-supported print and media outreaches, conferences, college teaching, online engagement, and more, you can help people come to better understand the holiness and grace of God. 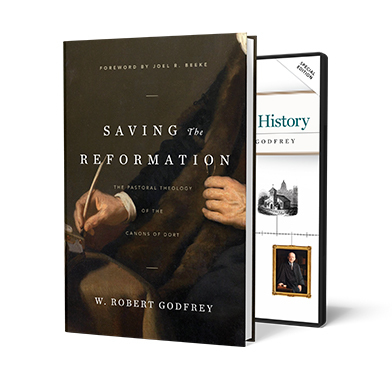 To thank you for your gift of any amount this month, we will send you a copy of my new book, Saving the Reformation, which explores the importance of the doctrines of grace and how they came to be. We believe it will help you better understand and rejoice in your salvation and why we must not compromise these truths. And if you give a gift of $100 or more, we will also send you my complete six-volume overview series, A Survey of Church History, on DVD so that you can see how the church has responded in every age to threats to the gospel. I believe R.C. said it best: In every generation, the gospel must be published anew with the same boldness, and the same clarity, and the same urgency that came forth in the sixteenth-century Reformation. You can join with us in this important mission. Thank you for standing with us as we seek to proclaim the fullness of God’s grace. Offer expires 5/30/19. Please allow up to six weeks for delivery after your gift is processed.